Just remember that many great calligraphers are left-handed. I was taught for a week by one of the best-known today, Gaynor Goffe. BUT because most people are right-handed, most resources and tools (and expectations) are shaped for right-handers, and this means that left-handed calligraphy does present a few more difficulties. So I've collected some information, links, and an experiment of my own here to remind myself that we're not all righties, and to give you some ideas. The one I refer to the most is the oldest, from 1979, by Vance Studley (yes: he appears, really, to be called Vance Studley. Perhaps that only seems funny to me because I'm British. Apologies ...). It's a good book: basic, practical, and he knows what he is talking about. I find Margaret Shepherd to be a reliable source of good practical information, too. Don't forget to make sure your work is well lit by white light from above and the right, so that your hand doesn't shade your writing. More on lighting here and here. Let's start with a short historical view of exactly why, mechanically, left-handed calligraphy is more difficult than right-handed. The basic set-up with regular (right-handed) calligraphy in the Western world is this: you move a broad, inked nib end over the page so it leaves behind a trail of ink that comes out variously thick and thin as it changes direction. The nib is flexible and slit, and it is kept pointing upwards and to the left so that its thinnest lines run bottom left to top right (slanting upwards as you read forward), and its thick lines run top left to bottom right (slanting downwards). Even formal Uncial, for which the nib-end is held very nearly horizontal, and Rustic Caps, for which it's held close to vertical, conform to this basic alignment. This is essentially a function of the tools, because it feels comfortable and natural for a right-hander to hold a quill pen at roughly forty-five degrees from the horizontal. Returning to the way Western right-handers use calligraphy pens. In addition to holding the pen at roughly 45 degrees, the right-hander naturally enough pulls the hand across the page and body from left to right, drawing the nib likewise across the page from left to right, and bringing ink smoothly with it. A quill pen cannot in fact be pushed easily without catching, bending and sputtering. In the same way, a metal nib (made to imitate a quill pen) tends to dig into the paper when pushed, resulting in sputs and blobs. This is why letterforms based on a circle are formed using two strokes, so the nib is never pushed. Fountain pen nibs designed for handwriting, rather than for traditional calligraphy, are specially made with a rounded, ball-like shape at the end of the nib so that it can be pushed as well as pulled. This way, round letters can be written in one stroke, and fluent movement of the pen maintained for speedy legible writing. Ball-point pens are likewise designed to move in any direction smoothly. When you hold a calligraphy pen in your left hand, three obstacles (at least) arise in trying to pursue the right-hander's 'natural state of affairs'. Some of these obstacles may already be very familiar to you from day-to-day writing, but I think they deserve to be looked at freshly in a calligraphic context. First difficulty: left-handed calligraphers undertaking to write standard Western scripts always, inevitably, find themselves pushing the pen across the page from left to right, instead of pulling it. As noted above, Western broad-edged pens object to this; the corners tend to catch, paper fibres may snag, the ink flow sometimes ceases or blots, it can be sputtery and scratchy and plain disagreeable. Second: suppose, to correct the problem described above, you decided to pull the nib towards your hand (right to left) for each stroke? As a left-handed calligrapher, the most comfortable natural writing position is to hold the pen with its nib pointing towards the right-hand-side or top right corner of the page. If you now pull the nib towards you to form a letter, you'll find that the alignment of the nib-end has changed. The thick/thin pattern of the strokes has become reversed. When a left-handed writer holds a broad-edged nib in a natural writing position, the thin line of the nib runs top left to bottom right (making the thin lines slant _downwards_ as you read forwards), while the thick line runs top right to bottom left. It's all been rotated 90 degrees clockwise. This is significant because it means that in forming any diagonal or curved shape from this position, the thicks and thins of historical, traditional, right-handed alphabet forms will no longer be in the same places as they would in the 'normal' letterforms, assuming the calligrapher is holding the pen in a natural, comfortable position. So ... the little 'starting lines' that form serifs go backwards, the diagonals are reversed in weight, the round 'o' shapes look unfamiliar and strangely unbalanced, etc. Third: the left-handed calligrapher's writing hand, if held 'naturally', would follow the pen across the words already written. As the ink is wet, the following hand smears it and spoils the work. In pencil or ballpoint this is less of an issue than with calligraphy ink, which can take a long time to dry. This leads to potentially intense disappointment and frustration, because one can't write steadily without smearing the letters just written. Furthermore, one's writing hand obscures what one's already written, which can make it hard to judge details of spacing, balance and other visual effects that the calligrapher usually determines in the course of writing. So what is a left-handed calligrapher to do? I've outlined these three problems because breaking it down might help find a solution that suits you. The basic desired outcome is to somehow move the pen nib round 90 degrees anti-clockwise in relation to the writing while remaining comfortably in control using your left hand. There are various ways you can tackle it, depending on how you've learned to write already, and where your hand lies in relation to the line. 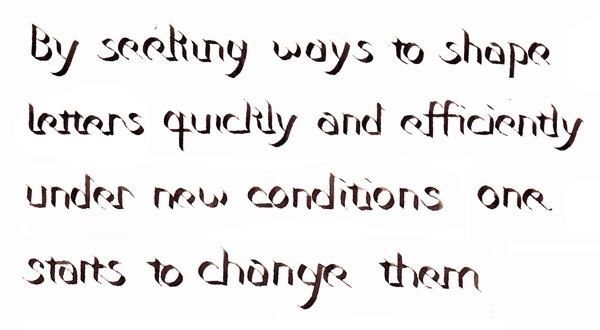 If you're an over-writer ('hook' method), you could perhaps create calligraphic letterforms by pointing the nib down the page towards its bottom right corner (the opposite of under-writing right-handers who would usually point the nib towards the top left) and then reversing all the letter-strokes – ie start at the bottom of the letter and work upwards. The pen angle will be correct, but you will need to get used to reversing the direction of each element of each stroke, which, particularly in rapid, flourished, and cursive scripts, will tend to give your writing a different aspect from that of a right-hander. But having a distinctive style can be a good thing. Also – pro tip – if you are using a dip-nib, you'll probably need to limit the quantity of ink you put on the nib so it doesn't fall off onto your work. But with patience and a good reservoir on the nib it could be done. You could also change your writing position just for calligraphy (this could be easier than you think; calligraphy is a bit like drawing, it doesn't have to be done with the same physical memory and brain training as regular handwriting) and come at the line from underneath. If you're an under-writer, and/or you move your hand over your writing as you go, the best answer is usually said to be to angle your wrist A LITTLE to bring the pen round anticlockwise, and also slant the paper anti-clockwise and/or use a left-handed nib which has been cut on a slant so it has an acute-angled, pointy right-hand corner. 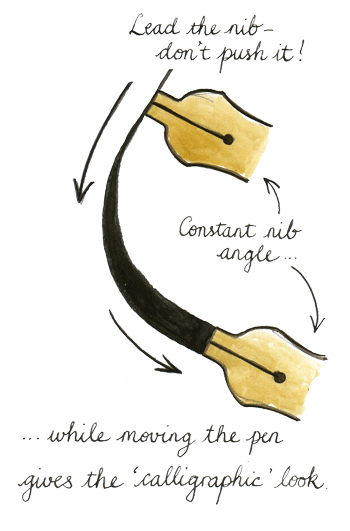 (In effect, the end of the nib has also been rotated anti-clockwise.) 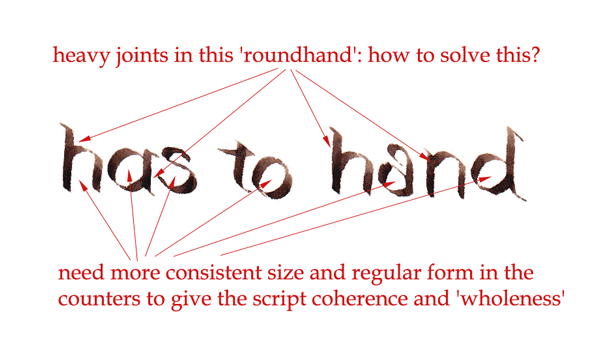 The combination of these three angles – hand, paper and nib-end – 'undoes' the 90-degree clockwise rotation that your left-handedness has introduced or, to put it another way, it lets you conform – it brings your writing materials into a position where it's possible to form calligraphic letters the same way a right-hander does. For everyone, including right-handers, it's a good idea to keep the pen close to vertical _in relation to the paper_, that is, pointing _into_ the paper not angling up it. Your hand should barely touch. This is hard to start with but necessary to develop fine control and a light touch. Holding the pen closer to vertical helps with ink flow and crispness of characters, and also helps you keep your hand off what you're writing. In principle, left-handers are at an advantage for the highly shaded flexible-nib scripts like copperplate, Spencerian, etc, because these require a steep nib-angle towards the top right corner of the paper. In practice, left-handers' experience varies. Some find it easier, some harder. 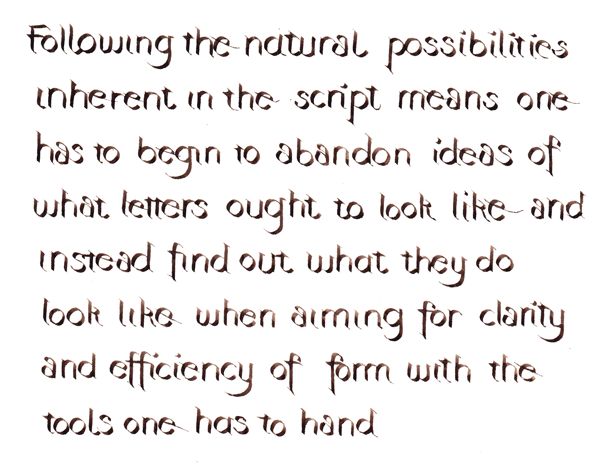 Your natural liking for and interest in a script will take you further than the handedness you're born with: if you love Gothic and hate Copperplate, you'll probably come to write better Gothic, even if as a lefthander you're 'supposed to be' naturally advantaged for Copperplate. After all, it has mostly been right-handers who've written Copperplate and spencerian styles of scripts, where they're 'supposed to be' disadvantaged. One thing is fairly sure, if you are interested in flex nibs: it's likely not worth your while buying the rarer, more expensive 'elbow' nibs for left-handed calligraphy. They don't seem to perform quite so well as standard Copperplate nibs anyway, they're more expensive, and were only designed to make it easier for right-handers to get the nib round to the correct angle. That's something you won't have difficulty with, so stick with original (good quality) copperplate nibs. As noted above, with patience and practice (which, let's remember, are just as necessary for a right-handed calligrapher), and forbearance when confronted with, for example, a summer-school teacher who doesn't know what to do with you (ahem ... guilty on one occasion) ... with patience, practice, and forebearance, a left-hander is well equipped to take on left-handed calligraphy in a right-hander's world. What if the majority of Western calligraphers had all been left-handed instead of right-handed ...? What if, as a race, we humans were 90% left-handers, and right-handers were the minority? You might say, well, in that case it would be easier to draw the pen from right to left across the page, so it would mean that we would all be writing lines of text from right to left, and forming our letters from right to left – like writers do now in the Arabic-speaking world. So, as a left-hander, why not write right-to-left? It's a little more radical than the adaptive solutions above, but it's possible for left-handers to cultive forms of mirror-calligraphy, like Leonardo da Vinci's notes but more aesthetically pleasing, which run from right to left across the page. If anyone else wants to read it, they can use a mirror, or learn to read backwards (which is not terribly difficult). There are already grand traditions of mirror-calligraphy in the Arab world which (so far as I know) usually feature script flowing both ways on the same page as part of a monogram-type design. Arabic lends itself to stylised forms in this way. There is no reason why Western calligraphy shouldn't go its own way with a mirror-uncial, mirror-italic, mirror-gothic, etc. I would LOVE to see a fully bound, illuminated mirror-written and mirror-illuminated book, which opens 'the wrong way round'. Why not? Alice Through the Looking Glass would be a good text to start with. But then ... as noted above, it's not necessarily true that if we were mostly left-handed we would all be writing from right to left. Because the majority of Arabic writers are right-handed, and still, they write right-to-left. Like everyone else in the world, they were using liquid ink to write with before the twentieth century, and they were writing it with broad-edged nibs too. And Arabic speakers (and Farsi and Turkish) have been doing this for more than a thousand years, and in doing so have created some of the most beautiful calligraphic books known to humankind. We're talking about at least three major civilizations famous for astounding calligraphy, in which the vast majority of writers started life in the exact same position that all Western left-handed calligraphers find themselves in: pushing a dip-nib across a page with the hand following after. Of course, against this, there is love and respect and admiration for what we already have. I am not arguing that left-handers should turn away from the existing scripts that have been evolved in a right-handed context. That isn't the point. The point is the potential and opportunity, using the tools we have in a different way, to develop new forms of beautiful writing in the form of specialised left-handed calligraphy. The letterforms making up such left-handed calligraphic scripts would have to be consciously re-evolved _as though Western civilisation had always been majority left-handed_. In other words, a back-to-front version of what actually happened in the Arabic-speaking world. Think about it. If everyone in school in Europe for the past fifteen hundred years had had to learn scripts in which the thin lines angle downwards ahead instead of upwards, if every Biblical scribe and copyist of the fourteenth century had been working left-handed as they laboriously traced out Gothic letterforms, if the exclusively left-handed Papal Curia had developed smart cursives running left-to-right, what would traditional calligraphy look like today? I've started the beginning of a right-hander's answer which I hope others will take up and develop further at some point. Let me emphasise: I wasn't trying to write traditional right-handed calligraphy the other way round. I wanted to start to imagine what a genuinely left-handed Western calligraphy could look like. It's different. I think it has potential. 1. As noted above, Western nibs don't work well being pushed. My answer in the script pictured here was to pull the nib left-to-right for each individual stroke (and sometimes each letter) but to form each word right-to-left. If you think that's mad, consider that Hebrew is still written that way, and Chinese is traditionally written starting in the top right corner of each page such that each character is formed with left-to-right strokes, forming part of a sequence of characters that runs vertically down the page to form columns that in turn march right-to-left across the page. So nothing is set in stone. 2. The thicks and thins fall in different places within a letterform. 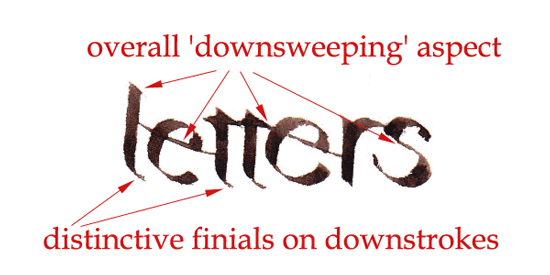 One of the big 'things' in calligraphy is Proportions of the Letterforms, making sure the counter:line ratio is good, keeping the visual impact of each letter within a certain aesthetic margin by tweaking its height-to-width and being very careful about where the thins and thicks fall. So the new left-handed letterforms will have to be re-evolved to look nice in their own way. You can see that they look a little like shadow-writing, and the hairlines and aspect are downwards-facing. It gives the writing necessarily a different flavour. 3. If you're pushing the pen, the way letters join is different from how they join if you're pulling (see above). When you come to think of it, there's no particular reason why letters have to join the way they do except that that's where the pen stroke naturally ends. If, because one's evolving a new kind of alphabet, the last pen stroke ends in a different place from 'normal', then the joining stroke to the next letter is going to be in a different place from 'normal' too. So we would have to get used to some new kinds of liaisons between letters. OK it's not the Book of Kells yet. But overall I think this is an exciting possibility. As well as better resources for writing right-handed calligraphy with the left hand, it's perhaps also time to create a new breed of left-handed calligraphy designed for left-handers. In any case: have fun! Challenge conformism! Make beautiful things! I don't have any affiliate connection with these retailers. They're just included to be useful.